A dead or decaying tree can reduce the value of your property and also pose a health and safety hazard. Prompt removal may be necessary to protect your property. 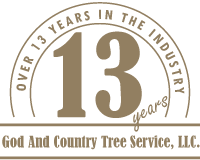 If you have a logging operation and need an experienced faller, who can get the most out of your logs, and can lay them straight for easy removal contact God And Country Tree Service, LLC.. We are fully insured to handle logging operations.